Have you read 2666? Compare your thoughts and feelings about it to an equally long novel. First, you may see more the mishmash of 2666. Second you may see what a wheel spinner it also is. That’s what I see. What Bolano has going for him is that he was not a total sellout to the nefarious conventions and mores of his time, and he goes his own way. In fact, he had a good bit of the thoughtful rebel in him. What he has going against him, is that it’s fine to be against this and that, but he is not for very much, is he? In his fiction. The game (his own way) doesn’t seem to me to be much worth the candle (our time and expense). The tedium, the tedium! And the trivia. That that is true of much of praised contemporary fiction makes it no less troublesome. Bolano is a sometimes jaunty explorer of deserts but even then it’s still the desert. The vital wider world goes wanting, a few stabs at larger life aside. One can see why his work would become so celebrated in established circles. The vacuities don’t hurt him there. The fourth section consists entirely of retail violence. As horrific and significant as it is, it’s virtually off the map when one looks at the wholesale violence of the world, say that carried out by, for example, the major state in the world, the US. Obviously Bolano especially in that section is in the relevance to the world, journalistic and crime line of the novel. But that’s what I mean by “a stab” at larger life. Sure, the stabs are there, even bulked in like excess fiber, but in both a marginal and a marginalized way, leading essentially nowhere. Like I said, very establishment. Compare to the off the radar big novels Wizard of the Crow (2006) by Ngugi, or to Les Miserables (1862) by Hugo. I’ll add that the problem with creating great novels as with creating great (or even survivable) culture is that the right is bankrupt and the left is broke. (And the middle is middlin’.) I think only as part of the rebuilding and the establishing of the left can the needed novels be written, that is the far greater novels than the celebrated pap that dominates. No blueprint for this but I think there’s a knowing where to to look, or at least a recognition of where the light is that helps, that is the only chance. While it may appear that the novel collapsed in the “West” of its own weight around the turn of the century, a century ago, very roughly, I think it’s more accurate to note that it collapsed, or was warped, due to sociopolitical throttling. The novel was partially revived in the twentieth century by the international and multicultural forces of the left – from where it seems to me the most exciting and promising developments continue to appear. 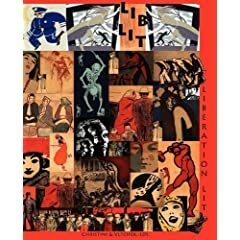 Much of this history and creativity is explored in our recently released Liberation Literature anthology. In a scathing article, Jerome Stolnitz (1991) argued that art has only short term effects. Greek drama is regarded as powerful but, says Stolnitz: “There is no evidence that Aristophanes shortened the Peloponnesian War by so much as a day” (p. 200). Stolnitz asserts that effects of art simply do not appear in history.